The Seattle Mariners 2002 season was their 26th since the franchise creation, and ended the season finishing 3rd in the American League West, finishing with a record of 93-69. 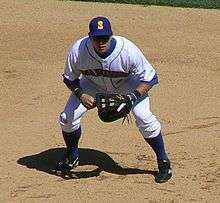 December 7, 2001: Bret Boone was signed as a Free Agent with the Seattle Mariners. December 19, 2001: David Bell was signed as a Free Agent with the Seattle Mariners. On May 2, 2002, Mike Cameron hit four home runs in one game versus the White Sox. John Mayberry, Jr. (pictured) was the Mariners first round pick in 2002. First pick John Mayberry, Jr. The following is a list of 2002 Seattle Mariners draft picks. The Mariners took part in the June regular draft, also known as the Rule 4 draft. The Mariners made 50 selections in the 2002 draft, the first being outfielder John Mayberry, Jr. in the first round. In all, the Mariners selected 23 pitchers, 12 outfielders, 5 catchers, 3 second basemen, 3 shortstops, 3 third basemen, 3 second basemen, and 1 first baseman. Gaby Sánchez was selected in the 15th round of the 2002 draft by the Mariners. 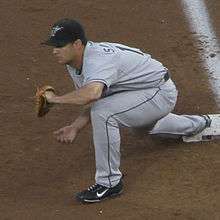 With the 700th pick of the 2002 draft the Mariners selected Travis Buck. In the 39th round the Mariners selected Bryan LaHair. ↑ "John Mayberry Statistics and History". Baseball-Reference. Retrieved September 29, 2011. ↑ "Josh Womack Baseball Stats". The Baseball Cube. Retrieved September 29, 2011. ↑ "Eddy Martinez-Estevez Baseball Stats". The Baseball Cube. Retrieved September 29, 2011. ↑ "Randall Frye Baseball Stats". The Baseball Cube. Retrieved September 29, 2011. ↑ "Kendall Bergdall Baseball Stats". The Baseball Cube. Retrieved September 29, 2011. ↑ "Troy Cate Statistics and History". Baseball-Reference. Retrieved September 29, 2011. ↑ "Evel Bastida-Martinez Baseball Stats". The Baseball Cube. Retrieved September 29, 2011. ↑ "Brandon Perry Baseball Stats". The Baseball Cube. Retrieved September 29, 2011. ↑ "Terry Forbes Baseball Stats". The Baseball Cube. Retrieved September 29, 2011. ↑ "Brian Stitt Baseball Stats". The Baseball Cube. Retrieved September 29, 2011. ↑ "Jared Thomas Baseball Stats". The Baseball Cube. Retrieved September 29, 2011. ↑ "Matt Hagen Baseball Stats". The Baseball Cube. Retrieved September 29, 2011. ↑ "T. A. Fulmer Baseball Stats". The Baseball Cube. Retrieved September 29, 2011. ↑ "Theiborh Almanzar Baseball Stats". The Baseball Cube. Retrieved September 29, 2011. ↑ "Gaby Sanchez Statistics and History". Baseball-Reference. Retrieved September 29, 2011. ↑ "Ryan Leaist Baseball Stats". The Baseball Cube. Retrieved September 29, 2011. ↑ "Corey Harrington Baseball Stats". The Baseball Cube. Retrieved September 29, 2011. ↑ "Gary Harris Baseball Stats". The Baseball Cube. Retrieved September 29, 2011. ↑ "Chris Kroski Baseball Stats". The Baseball Cube. Retrieved September 29, 2011. ↑ "David Viane Baseball Stats". The Baseball Cube. Retrieved September 29, 2011. ↑ "Eric Blakeley Baseball Stats". The Baseball Cube. Retrieved September 29, 2011. ↑ "Hunter Brown Baseball Stats". The Baseball Cube. Retrieved September 29, 2011. ↑ "Travis Buck Statistics and History". Baseball-Reference. Retrieved September 29, 2011. ↑ "Johnnie Bassham Baseball Stats". The Baseball Cube. Retrieved September 29, 2011. ↑ "Cory Vanderhook Baseball Stats". The Baseball Cube. Retrieved September 29, 2011. ↑ "David Bernat Baseball Stats". The Baseball Cube. Retrieved September 29, 2011. ↑ "R.C. Dickerson Baseball Stats". The Baseball Cube. Retrieved September 29, 2011. ↑ "Vance Hall Baseball Stats". The Baseball Cube. Retrieved September 29, 2011. ↑ "Michael Nesbit Baseball Stats". The Baseball Cube. Retrieved September 29, 2011. ↑ "T. J. Bohn Statistics and History". Baseball-Reference. Retrieved September 29, 2011. ↑ "Clayton Stewart Baseball Stats". The Baseball Cube. Retrieved September 29, 2011. ↑ "Dane Awana Baseball Stats". The Baseball Cube. Retrieved September 29, 2011. ↑ "Kile Patrick Baseball Stats". The Baseball Cube. Retrieved September 29, 2011. ↑ "Brady Burrill Baseball Stats". The Baseball Cube. Retrieved September 29, 2011. ↑ "Patrick Pfeiffer Baseball Stats". The Baseball Cube. Retrieved September 29, 2011. ↑ "Jermaine Smith Baseball Stats". The Baseball Cube. Retrieved September 29, 2011. ↑ "Brad Rose Baseball Stats". The Baseball Cube. Retrieved September 29, 2011. ↑ "Deandre Green Baseball Stats". The Baseball Cube. Retrieved September 29, 2011. ↑ "Bryan LaHair Statistics and History". Baseball-Reference. Retrieved September 29, 2011. ↑ "Josh Cooper Baseball Stats". The Baseball Cube. Retrieved September 29, 2011. ↑ "Andrew Edwards Baseball Stats". The Baseball Cube. Retrieved September 29, 2011. ↑ "Brandon Jones Baseball Stats". The Baseball Cube. Retrieved September 29, 2011. ↑ "Adam Pernasilici Baseball Stats". The Baseball Cube. Retrieved September 29, 2011. ↑ "Omar Borges Baseball Stats". The Baseball Cube. Retrieved September 29, 2011. ↑ "Raymond Lockhart Baseball Stats". The Baseball Cube. Retrieved September 29, 2011. ↑ "Roberto Mena Baseball Stats". The Baseball Cube. Retrieved September 29, 2011. ↑ "Jason Godin Baseball Stats". The Baseball Cube. Retrieved September 29, 2011. ↑ "Cardoza Tucker Baseball Stats". The Baseball Cube. Retrieved September 29, 2011. ↑ "Justin Ruchti Baseball Stats". The Baseball Cube. Retrieved September 29, 2011. ↑ "Oliver Arias Baseball Stats". The Baseball Cube. Retrieved September 29, 2011. Wikimedia Commons has media related to 2002 Seattle Mariners season.